Certified Green homes are synonymous with sustainability, energy efficiency and a positive environmental impact, but did you know that living in a Green home is better for your health, too? Adhering to third party green building standards such as those set by Built Green in Seattle and Earth Advantage in Portland, helps ensure Green Canopy Homes are both better for the environment and better for our health. We reduce common health hazards by paying close attention to how we build our homes and what we put in them. Here in the Pacific Northwest, we are no strangers to moisture and the issues that it can present. Water damage is often a result of inadequate construction, ranging from poor window installation, leaky roofs, and inadequate framing. Mold and mildew are common signs of moisture issues, and can be a significant trigger for allergies and rashes, making the home uncomfortable and sometimes unsafe to live in. To build a home that is well sealed, Green Canopy uses several weatherproofing methods – this allows for both protection from the elements as well as energy efficiency. 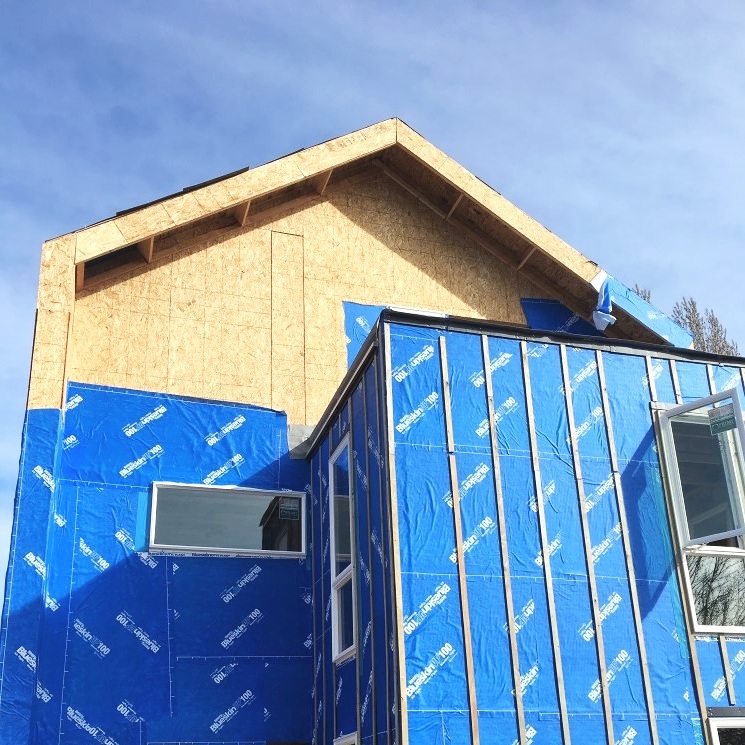 One of these tools we use is Blueskin, a self-sealing barrier that we wrap around the exterior framing of our homes to keep out air and moisture. In addition to reducing the risk of moisture, it also prevents drafts from entering the home, improving both comfort and reduced energy costs. As homeowners are becoming more aware of the contaminants found in furniture, cleaning supplies, and other everyday objects, the demand for a healthier living space is increasing. By using zero-VOC (Volatile Organic Compounds) paint, adhesives, and finishes we ensure there is minimal off-gassing from the products that are installed within our homes. VOCs, noted by that familiar “new paint smell”, can cause dizziness and headaches. While most VOCs leave the paint as it dries, some paints release VOCs into homes for years. The toxicity of VOCs can cause both short and long term health effects. Green Canopy homes use paint that is VOC-free, and complies with environmental regulations and guidelines. We also make a deliberate decision to install non-gas appliances. Gas appliances like stoves, furnaces, and water heaters release toxic byproducts into a home including nitrogen dioxide, carbon monoxide, and formaldehyde. Our induction stoves eliminate the risk of fumes that gas stoves release while cooking, while additionally providing a quicker cook time and precise temperature control. Homes are the nexus of our lives. Green Canopy believes that living in a sustainable and healthy home will inspire our homeowners to embrace a sustainable and healthy lifestyle. To learn more about our theory of change and impact, check out our Impact Report.